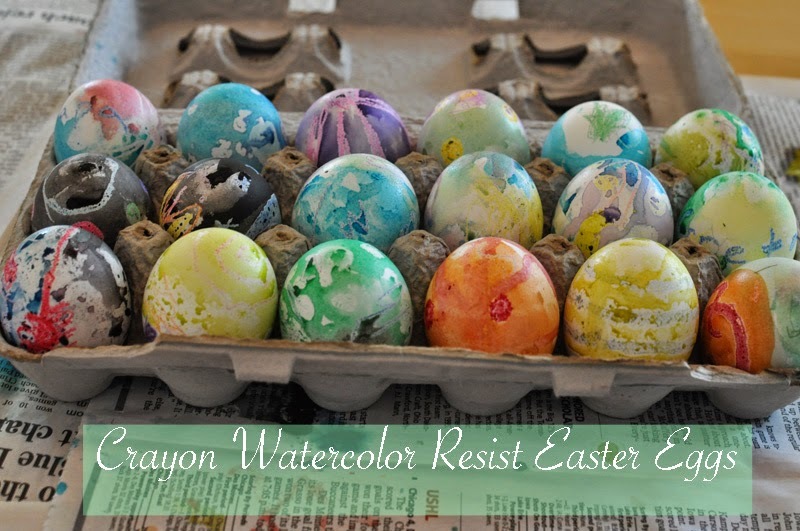 I opted for something right up my art teacher alley for Easter egg decorating this year and went with the tried and true magic of crayon and watercolor resist. Just as I suspected, they were a hit with my toddler! We started with 18 hard boiled eggs, and only allowed them to cool slightly after cooking. The heat from the still freshly cooked eggs caused the crayons to melt just a bit as we drew on them. A folded up rag was a great way to hold the warms eggs in place while we drew. 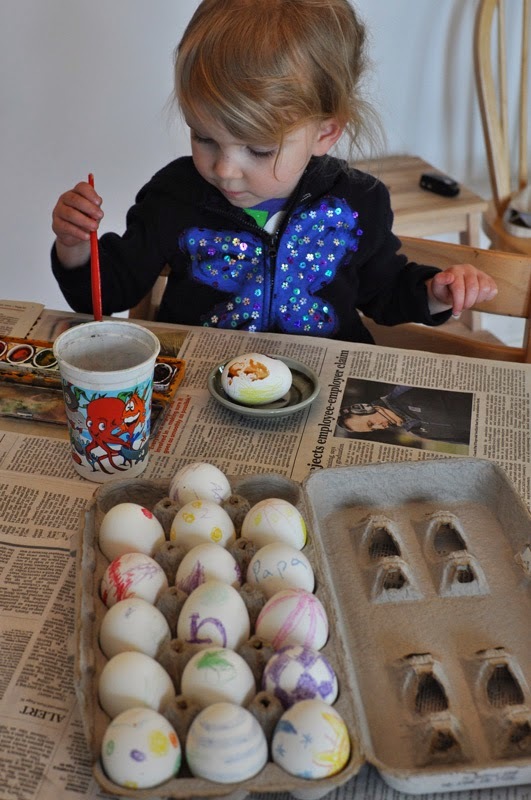 After all the crayon was done, we cooled all the eggs off. Then we broke out the non-toxic watercolor paints. We used small dishes to hold our eggs in place while we painted. 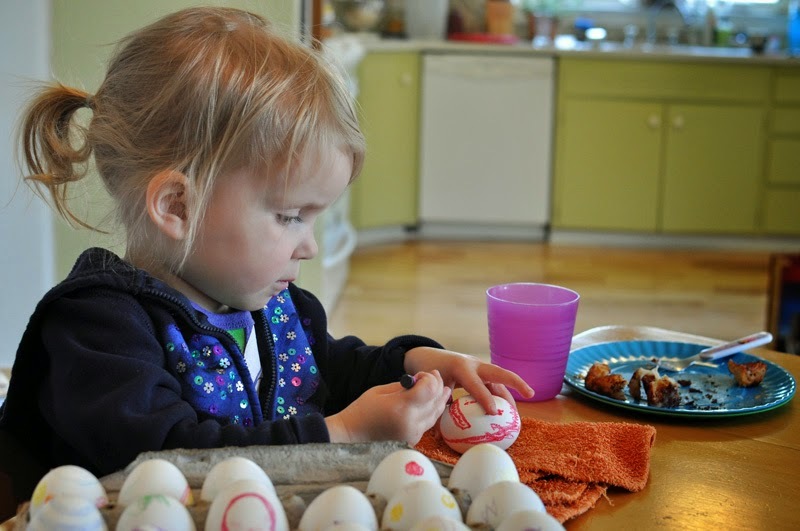 Greta had plenty of help decorating her eggs while we cooked the Egg, Hash-brown, and Sausage Breakfast Casserole. The eggs turned out beautifully. I loved how the colors swirled and mixed together. The wax crayons resist the watercolor paints to make equally interesting designs. If you want brighter colors, allow the paint to dry and then add another layer. We put them back in the fridge until the Easter bunny hid them the following morning. WARNING: the egg whites beneath turn a funky color and I opted not to eat these. 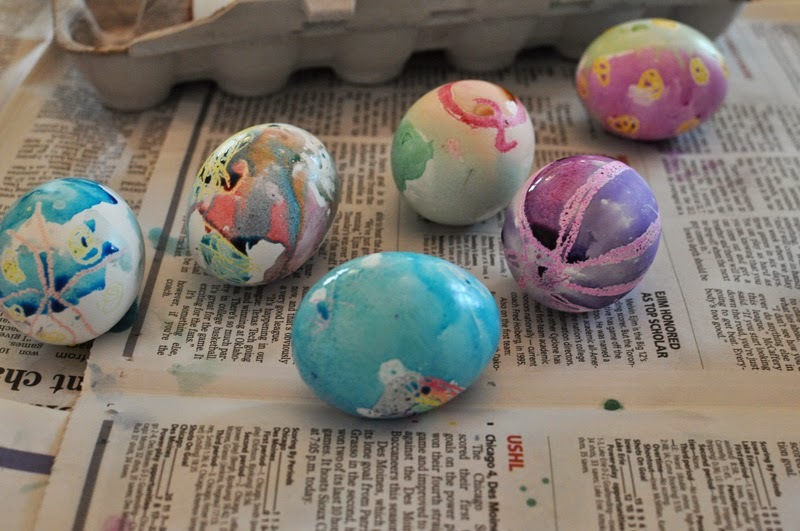 In the future I am going to do this on blown eggs and perhaps try painting with natural dyes as well. Also note that watercolor paint is not as permanent as dye and it therefore can rub off onto surfaces even when it is dry (in other words, don’t place them on white carpeting). 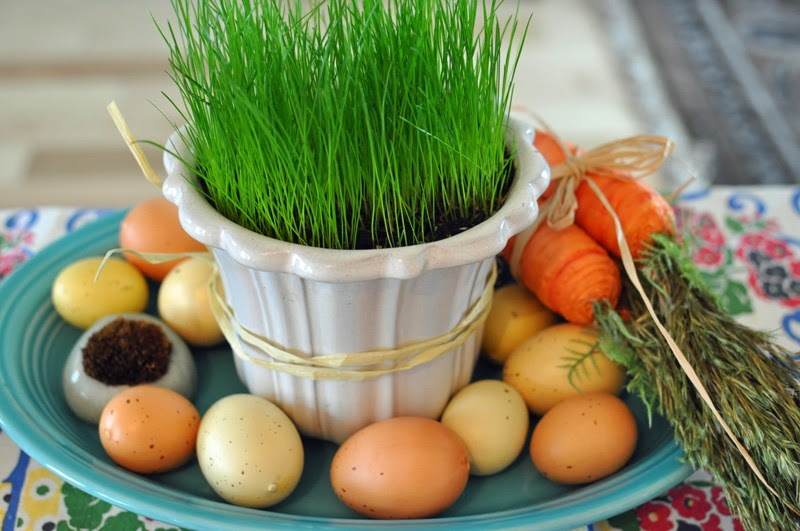 This is my easy as pie Easter centerpiece – fake eggs, paper carrots, my moss rock, and a pot of fresh bright green grass that I started from seed the week prior to Easter. It just brightened my table and even my mood just seeing it. 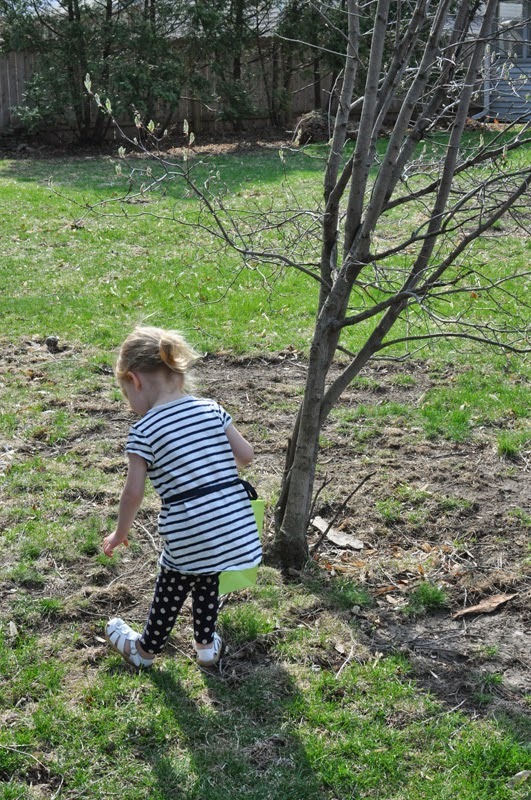 After brunch, we headed outdoors to hunt for eggs. Look at all the green! I am loving the fact that spring is here. This simple 4 ingredient breakfast casserole is perfect for serving a large group or saving for leftovers. My mother in law brought a similar one for our Christmas brunch and I’ve been thinking about it ever since. Since I didn’t have her recipe, I winged it and was quite pleased with the results. 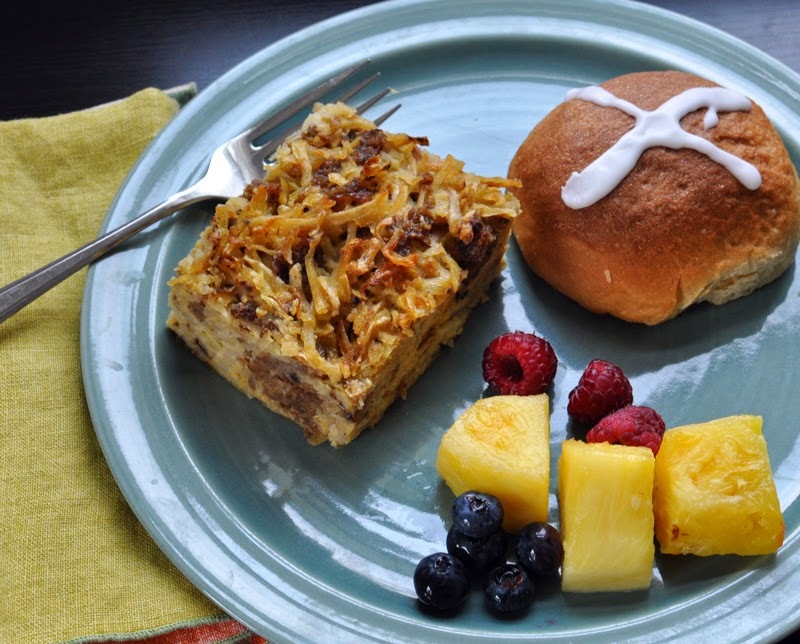 We had this delicious meal this morning with my side of the family for Easter brunch. My mom even mentioned how great it would be to give as a food gift for new babies, illness, or deaths in the family. She’s right – how nice to have something other than a lasagna! I started off using the Lodge Cast Iron Wok I got for Eric’s birthday as the method of cooking the hash browns. Thankfully, Eric quickly stepped in and took over. 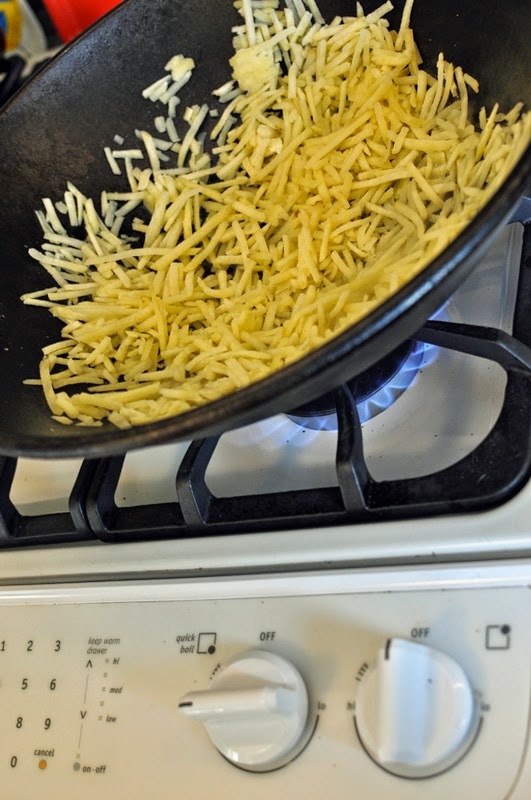 I don’t know why I am so impatient when it comes to hash browns, but I always want to over stir them, flip them too soon, and just plain ruin them. The wok was perfect for the job of browning hash browns – the heat stayed high enough and you could spread out the potatoes enough. The cooked hash browns got dumped into a glass casserole dish. I added eggs, almond milk, salt, pepper and cut up vegetarian sausage patties to the prepared hash browns. One could easily swap our the vegetarian sausage for real sausage and the almond milk for regular dairy milk. 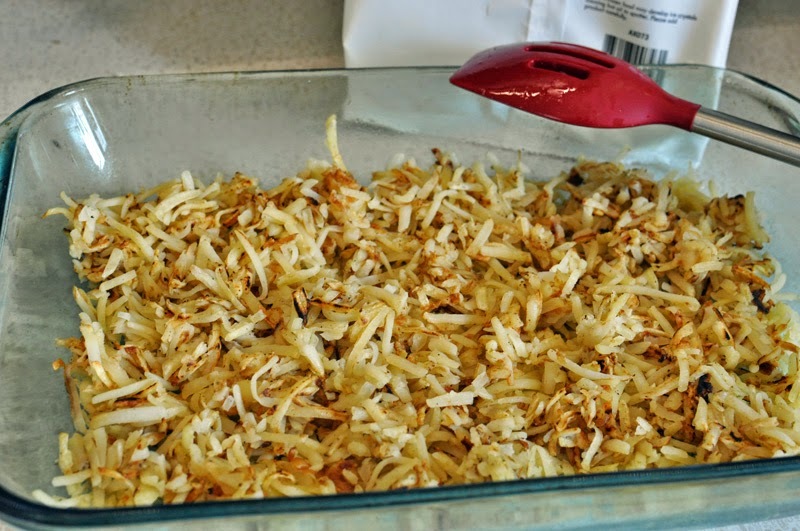 I used Alexia hash browns – they are fantastic and come pre-seasoned with garlic and onion. I cooked this casserole last night, let it cool, refrigerated it, and then simply reheated in the oven while covered in foil, at 275° for about an hour. 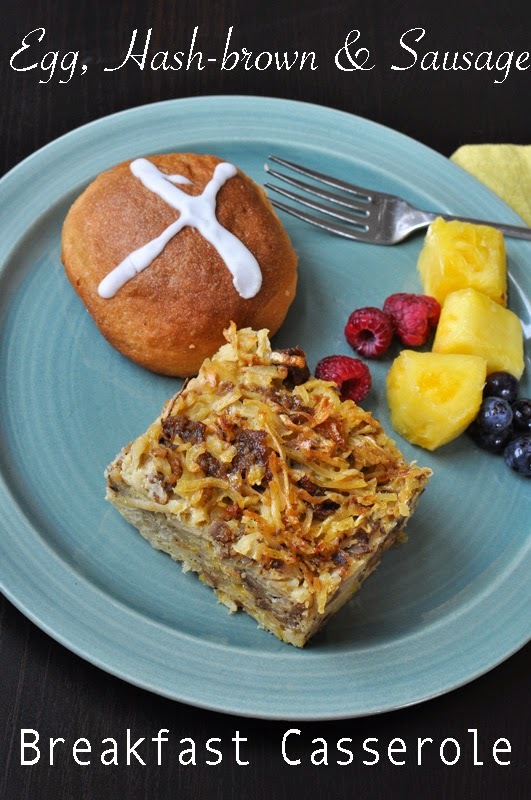 We served this with my mom’s hot cross buns, fresh fruit, and coffee. It was the perfect Easter morning family brunch. 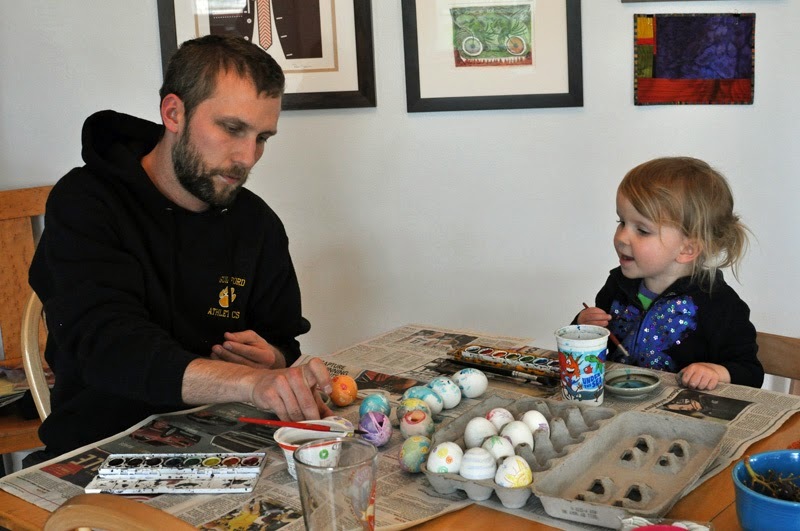 Stay tuned for more on our Easter crafts, Easter eggs, and Greta’s Easter experiences. 1. Prepare 2 bags of frozen hash browns (2 lbs), according to package. Transfer to greased 9 x 13″ baking dish. 2. In a large mixing bowl beat: 9 large eggs. Combine with the eggs: 1 cup almond milk (or dairy milk), salt and pepper to taste, and 8 oz. 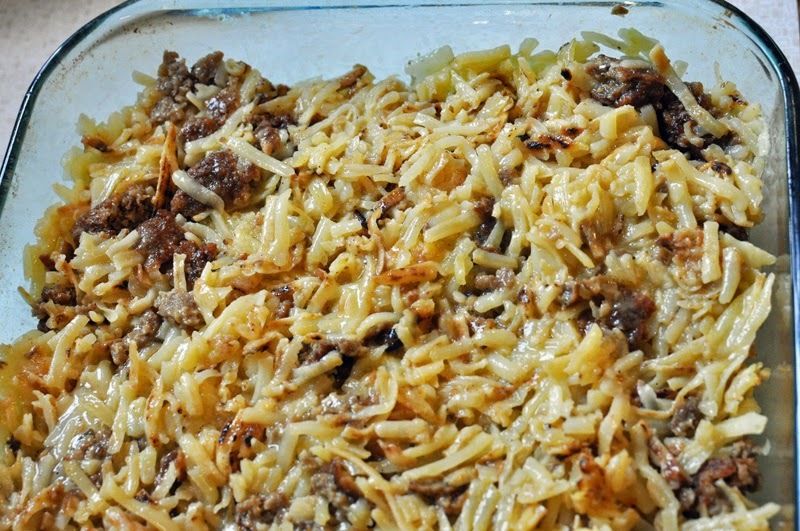 crumbled veggie sausage (or real sausage). 3. Pour egg mixture over the hash browns and mix to combine. Cover in foil, bake in a 350° oven for 50 – 60 minutes or until browned and egg fully cooked. Serve warm. I dreamed up these bad boys in celebration of Eric’s birthday celebration with our families. I made them late Saturday evening after a day-long celebration of kids’ birthdays at a friend’s house and then later at Chuck E. Cheese. This was Greta’s first time at Chuck E. Cheese and she was not at all disappointed. I, on the other hand, was a little anxious as she crawled around in the tunnels far above my head on her own. I kept having nervous thoughts about what would happen if she decided she was claustrophobic or panicked – how on earth would I get her down? 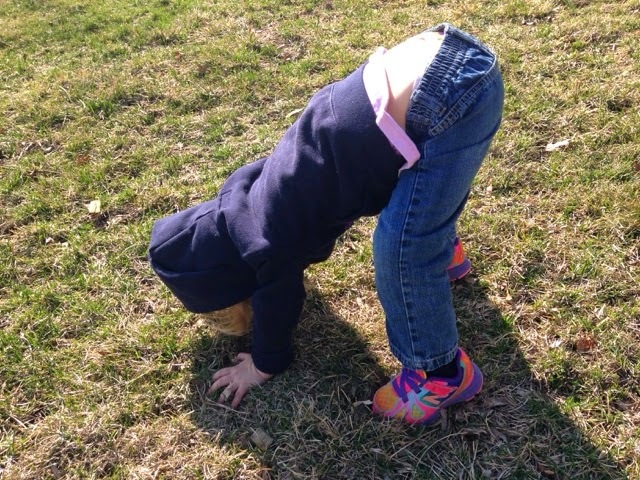 Luckily, a friend of hers from school had an older sister there who helped her down when she did decide that she was not going to take the tunnel slide down. Anyways, we both survived and after she finally tumbled into bed, I stayed up making these delicious cupcakes. It was late and I was tired, hence the cell phone images. To make the graham cracker base, I crushed graham crackers in a large bowl with a spoon. 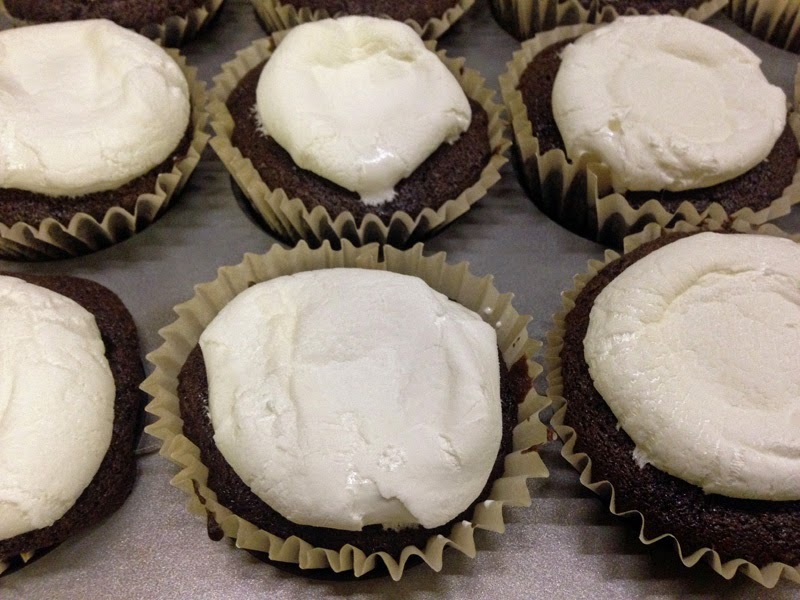 I then layered them in the base of the cupcake liners. 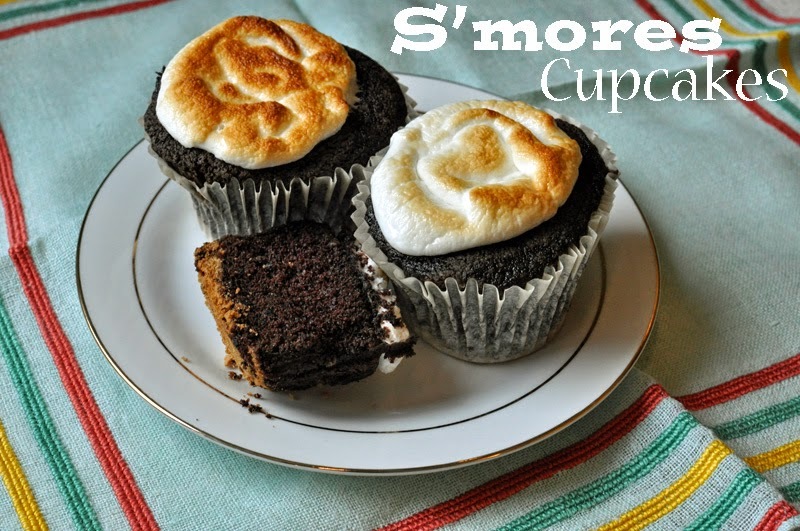 Next time I am going to create layers of graham crackers within the cupcakes for more of the graham flavor and add chocolate chips of pieces of chocolate for an even better s’mores experience. I poured the batter on top of the crushed graham crackers. Even adding a layer of grahams on top of the batter could be very tasty. 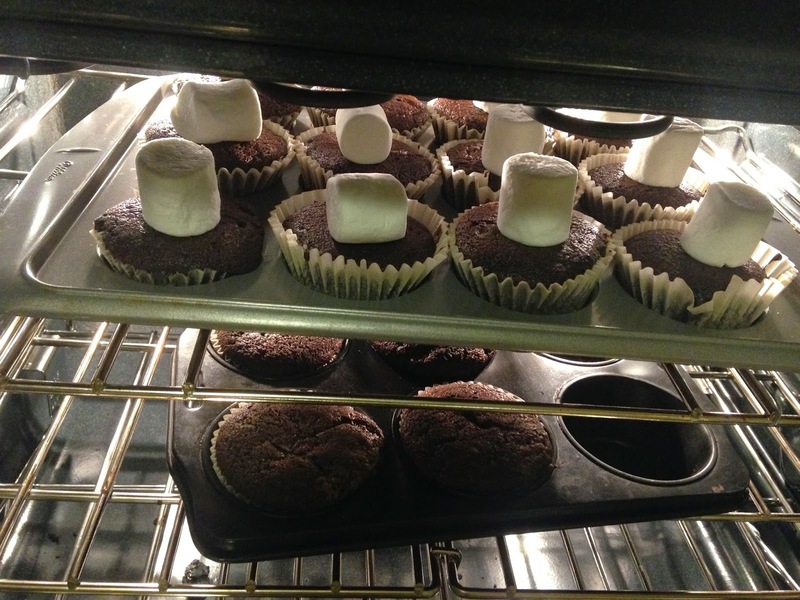 After the cupcakes were finished baking, I added the marshmallows on top and returned them to the oven to soften. For the large cupcakes, I used 2 marshmallows. Once the marshmallows are soft, simply flatten them with a spoon. Once they are flat, allow to cool or place them under the broiler to brown them. We celebrated Eric’s birthday Saturday with our two families with a nice lunch and then these tasty treats. It was a cold and down-pouring kind of day, though the two previous days were warm enough to wear tank tops and enjoy time outdoors. Today we awoke to a snowy landscape – not the first time Eric has had a snowy birthday! 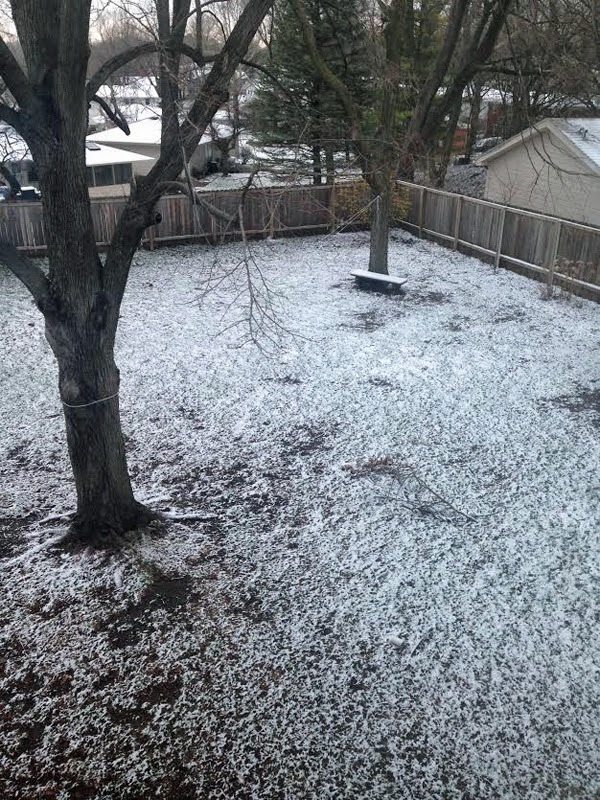 Such is spring in Iowa. 1. Allow butter and eggs to stand at room temperature for 30 minutes. Meanwhile, prepare cupcake pan with parchment cup liners. 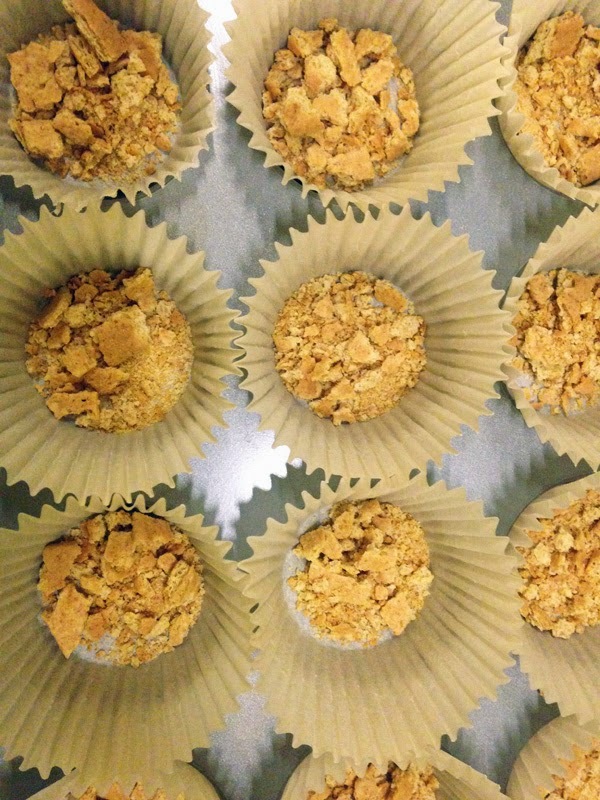 Add crushed graham crackers to the bottom of each cupcake liner. In a medium bowl combine: 2 cups all-purpose flour, 3/4 cup unsweetened cocoa powder, 1 teaspoon baking soda, and 3/4 teaspoons baking powder. 2. In a large mixing bowl or mixing stand beat: 3/4 cup butter on medium to high speed for 30 seconds. Gradually add 2 cups sugar, about 1/4 cup at a time, beating on medium speed until well combined (3 to 4 minutes). Scrape sides of bowl; continue beating on medium speed for 2 minutes. Add 3 eggs, 1 at a time, beating after each addition (about 1 minute total). Beat in 2 teaspoons of vanilla. 3. Alternately add flour mixture and 1-1/2 cups milk to butter mixture, beating on low speed after each addition just until combined. Beat on medium to high speed for 20 seconds more. 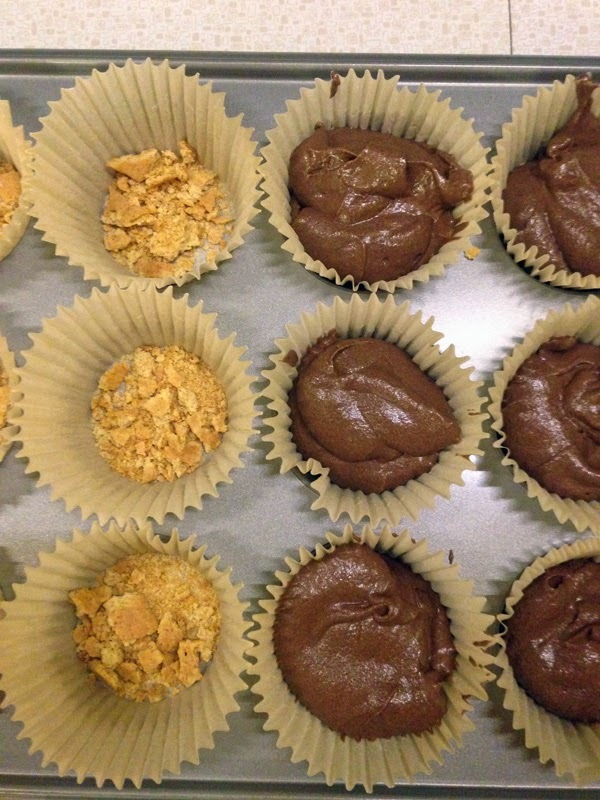 Drop batter into prepared cupcake liners. 4. Bake in a 350 degree oven for 25 to 30 minutes, or until a wooden toothpick inserted near the center comes out clean. 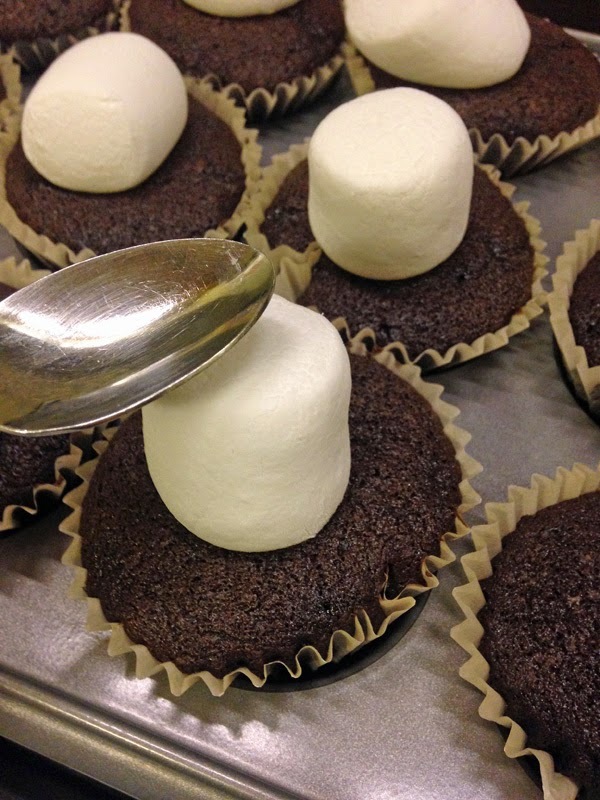 Place large marshmallows on the tops of each cupcake and return to oven for 1-2 more minutes or until marshmallows are soft enough to flatten with a spoon. 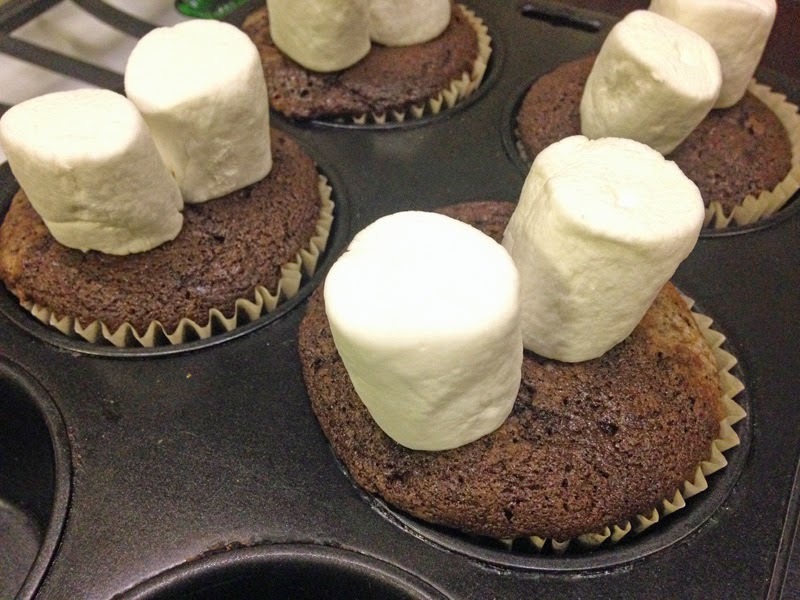 To brown the tops of marshmallows, place under broiler for 30 seconds. Allow cupcakes to cool for 5 minutes, remove from pan and allow to cool on wire racks. As I head into the third trimester, I can’t say that I have boundless energy for much aside from the essentials. However, I have been trying to avoid simply eating the first thing I happen come across and instead, eat well-rounded meals that include lots of veggies. I know how important it is to eat a variety if healthy foods while baby boy is still in the womb. I have to start developing that palate now! 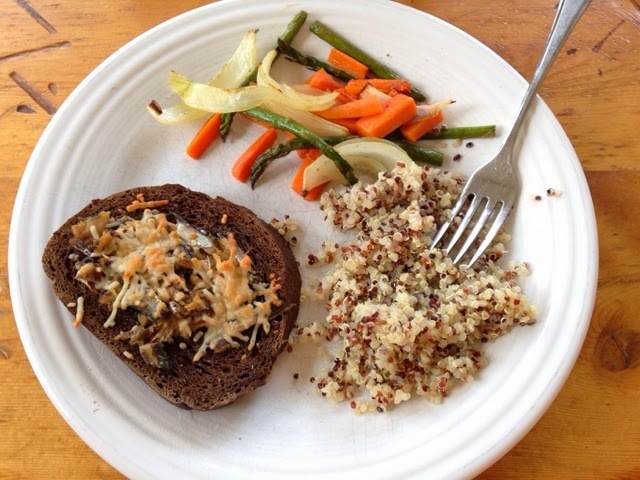 This simple veggie, grain, and fish meal was one I made earlier this week. For the veggies, I simply tossed yellow onion, carrots, and asparagus in olive oil and then roasted them in the oven at 425 for 20 minutes. 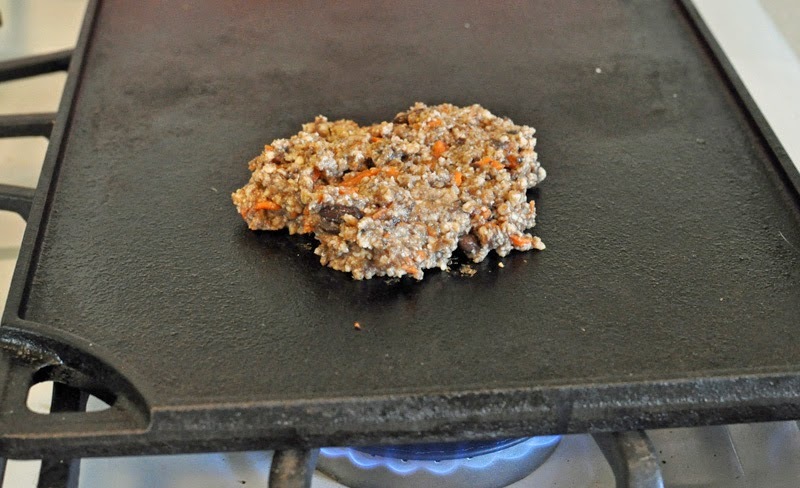 Meanwhile, I cooked some multi colored quinoa on the stove while the veggies were roasting. Side note: I’m really excited for gardening this year – my mom is going to try growing quinoa this year and I am looking forward to seeing this experiment through. 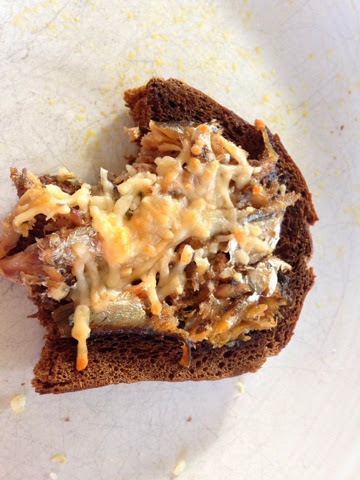 Lastly, I spread some sardines on sliced pumpernickel bread and sprinkled Parmesan cheese on top. I toasted these savory delights in the toaster oven for about 5 minutes. There you have it – an easy, quick and healthy weeknight meal. 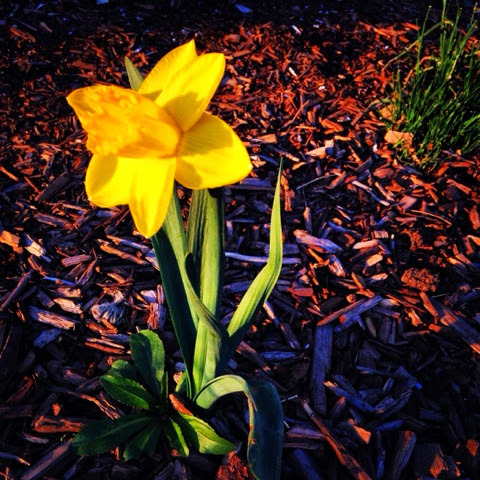 Iowa update: my first Iowa daffodils started blooming today. It’s been getting into the high 60s with a sprinkling of days in the 70s. I was driving the other day and kept wondering what was so different. Finally I realized the grass was relatively green! I felt giddy with the simple thought of green grass. After the winter we’ve had, who wouldn’t be thrilled by this simple revelation? 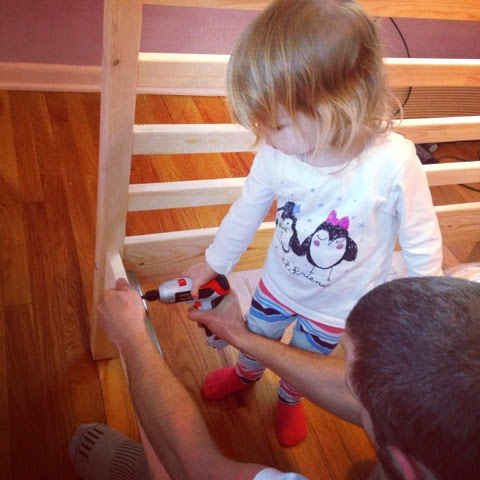 In other news, we finally made our Ikea run for Greta’s big girl bed. We successfully moved her into a new room, in preparation for baby boy. More on those two rooms at a later date. I first made these vegetarian and gluten-free burgers back in January when we had some friends over for dinner, and forgot about them until now. I decided to make them again, according to my scribbled notes, I was pleasantly surprised at their end result. It is a recipe I originally made up as I went – not always the best idea when company is coming over. 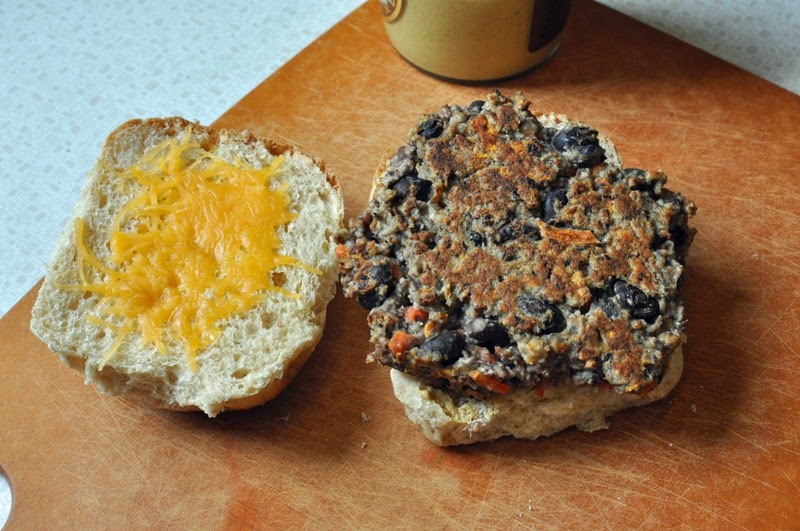 However, I did have some frozen veggie burgers on hand, as a back-up plan. The second time I made these burgers, I mixed everything the night before and popped it all in the fridge overnight before cooking them. 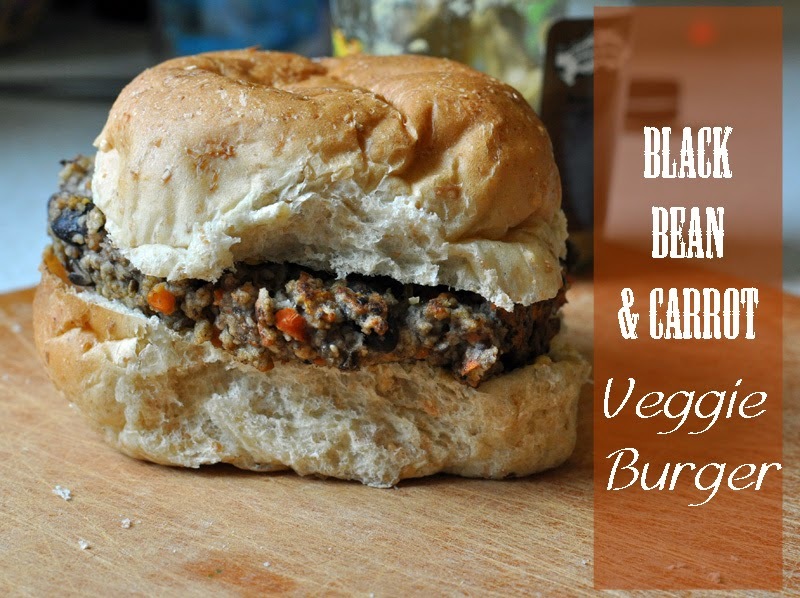 This recipe is so easy to whip up – it will no doubt become my go-to veggie burger recipe this summer. I can’t wait to try it on the grill! I used the trusty Baby Bullet to puree half the beans, half the carrot mixture, the scallions, and eggs. If you wanted to make this recipe egg-free, you could replace the 3 eggs with 3 tablespoons ground flax seed mixed with 6 tablespoons of water, or just simply increase the amount of panko as a binder. Cook over medium heat for 3-5 minutes per side, or till done. They should be a nice golden-brown and firm all the way through. 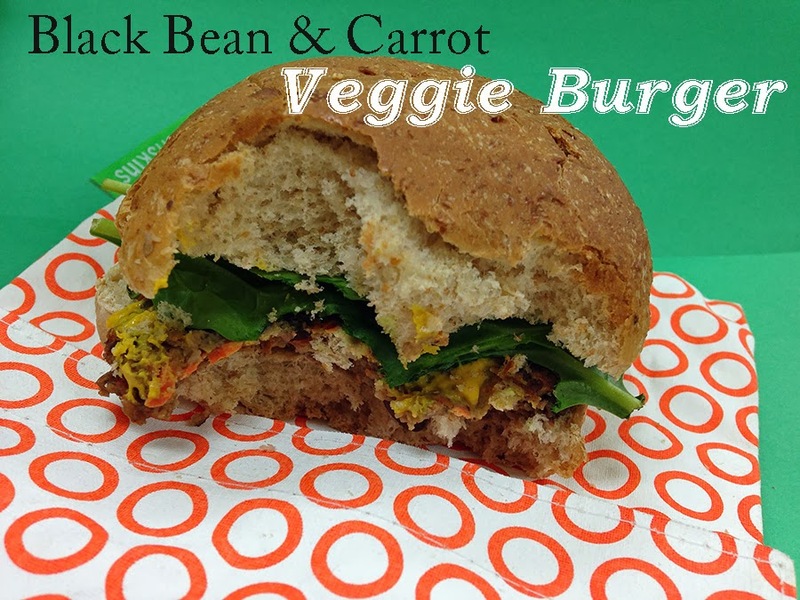 This photo shows a buried veggie burger – just the way I like them – covered in mustard, spinach, and on a big crusty bun. This just so happened to by a lunch at work one noon hour. The orange dotted thing is one of those nifty reusable sandwich bags. 1. In a small bowl combine: 2 grated carrots, 2 tablespoons lime juice, and salt and pepper to taste. 2. 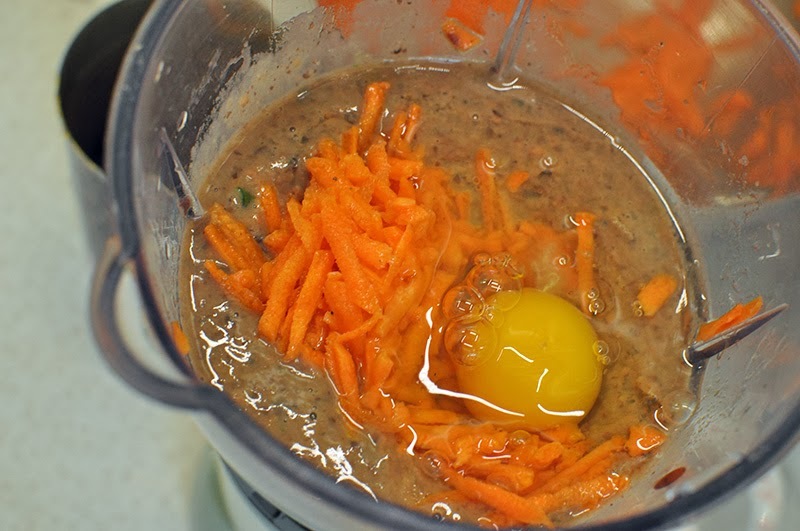 In a food processor or blender puree: 1/2 can of black beans, 4 tablespoons chopped scallions, 1/2 the carrot mixture, and 3 eggs. 3. Transfer puree to a medium mixing bowl. Combine with puree: remaining 1/2 can of black beans, 1 tablespoon chia seeds, 1 cup gluten-free or regular panko, and remaining carrot mixture. 4. Fry on griddle or pan over medium heat, 3-5 minutes per side or till done. Serve with toppings and bun of choice.